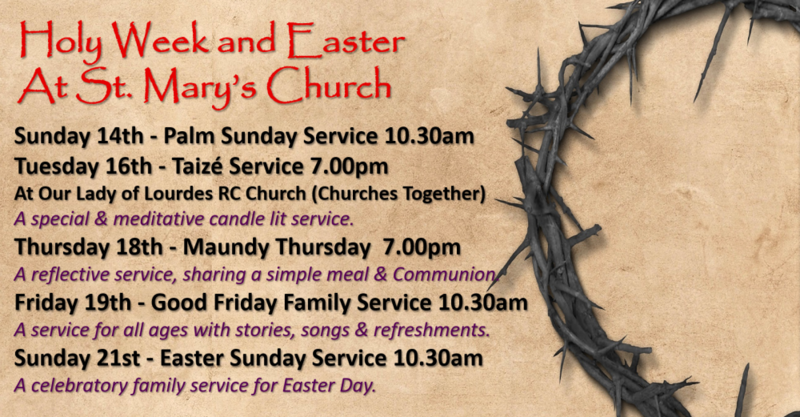 St Mary's is the meeting point for our growing and lively church family. The Bible describes the church as a family made up of all sorts of people, each with their own stories to tell and gifts to share. Some of us have belonged to the church for years, some have just started a journey of faith, others are visitors or are just passing through. Yet all are welcome - as together we gather to worship God through his Son Jesus Christ, grow together in our faith through God’s word and Spirit, and as we share God’s love in serving our community. As a family we meet on Sundays and throughout the week, for varied services including christenings, weddings and funerals, for social events, school assemblies, to support one another with practical and pastoral care, to pray for the needs of the world, to study God's word in the Bible, and to volunteer for many local charities and groups. You can find out all about the life of the church family by exploring this website. However you’ve found us, and for whatever reason you’re here - we are pleased to welcome you and we pray you will feel at home!